Although largely discounted by many critics with weak comparisons, there is something interesting, lurid, and likable about the independent film Cracks. As the first full feature helmed by the promising director Jordan Scott, perhaps even more so. It's a heavily threaded story that attempts to tackle one-sided rivalries, conformity, and perceived identities with a slow burn pace not so appreciated by many moviegoers, making Cracks one of the most clearly 'love it or hate it' films released this year. That is not to say the movie is heavy; it's surprisingly restrained, maintaining a growing creepiness that is never allowed to blow up. The restraint is also one of several reasons people poked at the film, usually dismissing the complicated plot in favor of under selling one specific detail. While that always works well enough for a sound bite, it doesn't work well with the movie. There are some parts that are better than the whole of the movie, but the movie works better as a whole more than any part. Cracks upgrades a novel that tried too hard to be unconventional. Based on the book of the same name by Sheila Kohler, the atmospheric measure goes beyond a simplistic message that children are savages or prone to rivalry. 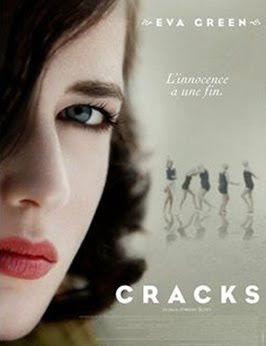 Cracks has a more interesting tale told by adolescents at a boarding school. In the book, the school is set in South Africa. In the film, it's set somewhere around the English coastline. Here, the environment is sheltered enough, creating a secluded and safe place for a dive team to strive for excellence under the watchful eyes of a dive coach. For the students, Miss G (Eva Green) is the idyllic role model in that she is a dashing and glamourous contrast to her colleagues. She is worldly and experienced, everything these young girls crave. The students have their roles too, with Di (Juno Temple) holding an influential position, readily reinforced by praise from Miss G. The other girls are equally settled, most of them relegated to a supporting cast with varied stereotypes. One exception is Poppy (Imogen Poots), a sophomoric lieutenant of sorts, who helps balance out Di's relentlessly brooding seriousness. This perfect world is shaken easily enough, shortly after the start when the daughter of a Spanish aristocrat (and royalty) is exiled for her illicit relationship with a commoner. The infusion of the young and worldly adolescent with a strong sense of self-indentiy is too much for the illusionary world they've created. Miss G has to face that her fantastical past can no longer hold up to scrutiny. Di suddenly has a rival if not among her peers, certainly around the teacher who once praised her as a favored pet. And the Spanish Fiamma has to come to terms that the boarding school expects her to relinquish her strong sense of self. Where Cracks sometimes cracks under its own dark beauty. All the girls perform their roles splendidly, including Laurel (Adele Mccann), Rosie (Zoe Carroll) and Fuzzy (Clemmie Dugdale). The script also demonstrates some talent from writers Ben Court, Caroline Ip, and Jordan Scott, who all were tasked with transforming a novel written in an unconventional first person plural for characters capable of standing on their own. Of the primary players, María Valverde is especially adept at remaining steadfast in her character, gracefully resistant to the pressures around her. Temple, through no fault of her own, plays the manipulated villain beautifully, but only hints at an internal conflict between her moral compass and personal gain. Any reviews referencing overt sexuality and lesbians are generally exaggerated. While certainly part of the film (and much more so in the book), Scott does a fine job shifting it from curiosity or predatory and toward something intangible (making it all the more creepy). In other words, Miss G's infatuation is less driven by sexual desire and more so by objectifying Fiamma, who has everything Miss G always wanted. Cracks Breaks Away From Formula At 6.9 On The Liquid Hip Richter Scale. This isn't necessarily a remarkable film as much as it is a mile marker for a few talented actresses and one promising director. It's also another nice break from the entertaining but more typical films elevated at the box office with an artistic sensibility. Anybody watching will be equally inclined to love or hate it, but mostly because you can make whatever you want out of it. Cracks can be rented from iTunes. If you like the film, look for it on DVD at Barnes & Noble. You can also find the film on Amazon.